A 3D-object displayed using a 3D-image spatial drawing device. Credit: National Institute of Advanced Industrial Science and Technology. A collaboration of the Japanese National Institute of Advanced Industrial Science and Technology (AIST), Keio University and Burton Inc. has produced a device to display "real 3D images" consisting of dot arrays in empty space. Many previous displays in 3D have been virtual images on 2D planes which, due to human binocular disparity, appear as 3D. However, the limitation of our visual field and the physical discomfort caused by wrongly identifying virtual images makes these displays less than perfect. 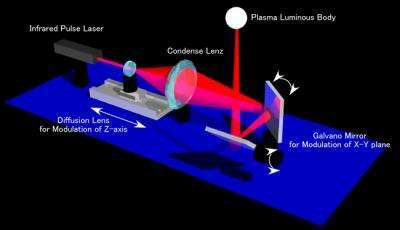 The new device uses the plasma emission phenomenon near the focal point of focused laser light. By controlling the position of the focal point in the direction of the x-, y-, and z-axes, real 3D-images in air (3D-space) can be displayed. Overview of the 3D-image spatial drawing device. Credit: National Institute of Advanced Industrial Science and Technology. Our living space and the objects within it are three-dimensional but while 3D imaging is well documented on the Internet, we don’t see "real 3D-images" on our computer screens. This is because our monitors are unable to display them. Keio University and Burton Inc. noticed that, when laser beams are strongly focused, air plasma emission can only be induced near the focal point. So, they experimented by fabricating a device to display 2D-images in the air. 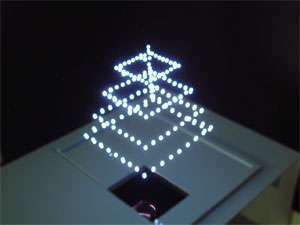 The images are constructed from dot arrays produced by a technique combining a laser light source and galvanometric mirrors. To form 3D-images in the air, the scanning of the focal point in the depth direction along the laser optical axis is essential. However, to do this, the quality of the laser and the technique for varying the position of the focal point must be improved. This explains why we do not yet have the technology to display 3D images. By modifying the 2D image device with a linear motor system and a high-quality and high-brightness infrared pulse, the AIST, Keio University and Burton Inc. created a spatial display of "real 3D images" consisting of dot arrays. The linear motor system can vary the position of the laser focal point by high-speed scanning of a lens set on the motor orbit. Incorporation of this system makes the image scanning in the direction of the z-axis possible. For scanning in the x and y axis directions, conventional galvanometric mirrors are used. The high-quality and high–brightness infrared pulsed laser (repetition frequency of pulse: approximately 100 Hz), enables plasma production to be more precisely controlled, resulting in brighter and higher contrast image drawing. Furthermore, the distance between the device and drawing points can be extended by several meters. The emission time of the laser pulse light is approximately a nanosecond (10-9 sec). The device uses one pulse for each dot. The human eye will recognize the after-image effect of plasma emission from displays up to 100 dot/sec. 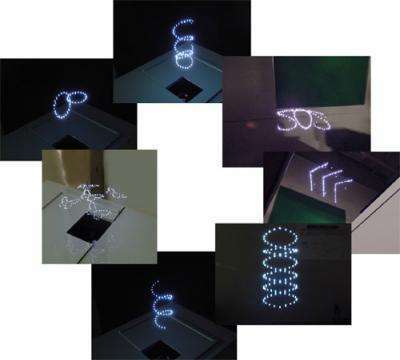 By synchronizing these pulses and controlling them with software, the device can draw any 3D objects in air.